Last night I had a bit of a cooking binge and it actually worked out (well, apart from the giant mess needing cleaned up this morning). Usually when I try to do too much at once, something goes wrong, as evidenced by the blisters on my fingers and thumb from Monday. At the time I started, I didn’t really think about the fridge space issue, so it’s a good thing that fridge supplies are (were) fairly lean at the moment! 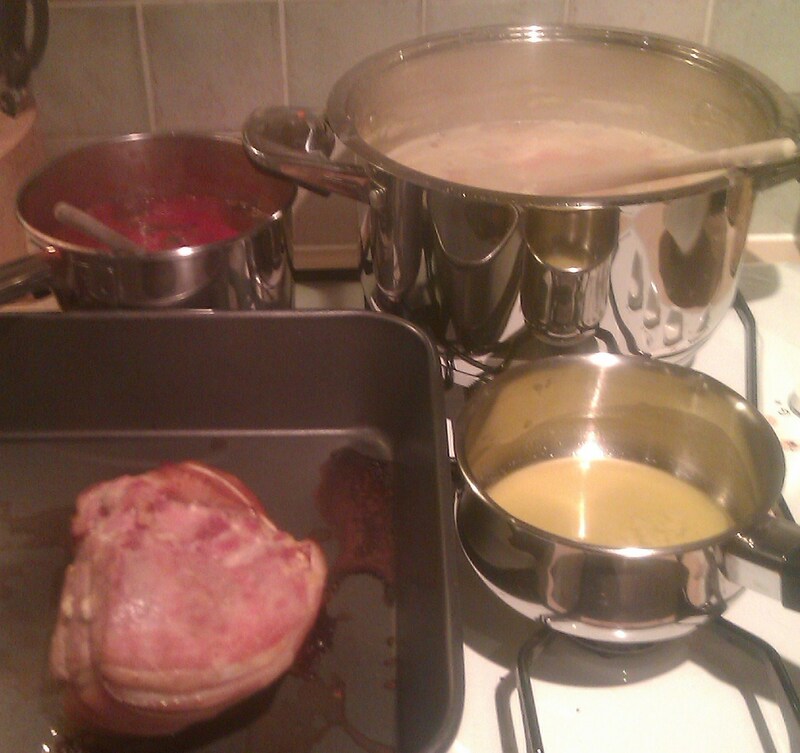 The gammon and the soup look fantastic, but I’m not tempting fate by posting too much about them until I’ve tried them. The soup was more or less my own creation, so I’ll post it here if it works, just to remind myself of the “recipe”. A whole bag of spinach feeds about 4 people. It’s easily halved if you only have half the spinach left. Pour 2 cans (or tetrapaks) of chopped tomatoes into a pan and heat. Cook all together for 15-20 minutes. Then add a bag of spinach (stalks removed if it’s normal spinach not baby spinach) and cook till spinach fully wilted. For such a trivial recipe, it’s extremely tasty. If I can be bothered, I make it up into a pasta bake with some brie on top, but usually just eat it as it is with pasta. Although I pride myself on being a from-scratch cook, there’s definitely a few corners I am perfectly happy to cut, and this recipe demonstrates all of them! Dried onion is a miracle product if you’re just looking to add a bit of taste and can’t be bothered with chopping. I don’t use a whole lot of garlic and chilli so the pre-chopped stuff is nice and easy and avoids waste. This entry was posted in Food, Home and tagged cooking, food, gammon, lazy cooking, recipe, spinach, tomato, tomato and spinach sauce. Bookmark the permalink.